As many of us know, there are a lot of films out there which are inspired by gambling, and the reason for this is because we love to watch people win, people lose, and people going through emotional turmoil during a great gambling scene. That said, however, not all gambling scenes are created equal. Some will bore you to death while others will excite you unbelievably, so please keep reading to find out which are the best gambling scenes featured in the movies. Way too many gambling scenes feature hard-boiled players, and that is why Lindsay Lohan’s performance as the twin sisters Hallie and Annie in The Parent Trap, circa 1998, is truly a refreshing and captivating one. One night, they embark on a mano-a-mano Poker game; and the loser of which has to jump into a nearby lake… with no clothes on. Annie stuns with a straight, but Hallie beats her with a royal flush. Undoubtedly, one of the greatest scenes featured in The Hangover is the Blackjack scene. Essentially this part of the film pays homage to another gambling-related movie (Rain Man, 1998), but that is not all. In it, Zach Galifianakis sports a beautiful gray suit and shows exceptional genius when counting cards. In the background, his mate Phil screams, “He can’t lose”. The Blackjack scene in Austin Powers is obviously a parody of all the James Bond gambling scenes ever made, demonstrating the ridiculous sense of confidence some players actually have. Austin loses, but that is beyond the point. He makes a unique comic performance, called “Immortal Romance”, portraying all gamblers that have no clue what is going on in the game. Heck, all that matters to Powers is how good he looks on the table, which makes the scene even more bizarre and humorous. When talking about Swingers, people always recall the bad advice Trent gives to his friend Mike when they go to Vegas together: 'Always double down'. In the scene, Mike plays Blackjack at a $100 minimum table, brashly placing down $300 through sheer bravado. His friend whispers, “Always double down on 11”. A few moments later the two start arguing as it turns out that sometimes you just have to listen to your gut. Now the notion of a smoke-filled backroom for holding poker tournaments may seem completely bizarre in today's day and age. Nevertheless, old-school poker has always been intriguing, and thanks to Guy Ritchie’s 1998 comedy caper, Lock, Stock and Two Smoking Barrels, it has become even more enticing. The best gambling scene in the film shows Fast Eddy and Hatchet Harry playing Three Card Poker. As the stakes rise, things get tough for Eddy and he needs to borrow money in order to continue playing. The scene is worth watching because it shows the real tension between each player. Choosing only one gambling scene from a film which is filled with unique gambling scenes is a really difficult thing to do. Yet, to us, the climax of Rounders is the final Texas Hold’Em showdown between Michael McDermott and his Russian opponent, Teddy “KGB”. A lot is at stake, for sure, as Michael has borrowed $10,000 from his professor in order to play. This is a do-not-make-a-noise scene that will make you hold your breath. Don't worry, though, because it won't be for long. Joe Pesci’s performance as Tommy DeVito in Martin Scorsese’s Goodfellas is among the best acting performances we have ever seen. In our favorite gambling scene, Tommy’s participation in a card game (rather than the actual game) mounts the tension. The reason: he is not on good terms with Spider, a guy that doesn't play at the table and doesn't bring Tommy a drink. So, in retaliation, he takes out his revenge in the worst possible way. Bang... you're dead. 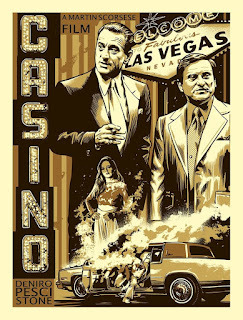 Casino wins hands down as the best gambling-related movie ever made. It shows the gambling industry at its worst; and features all the intrigue, paranoia, and violence that goes hand in hand with gambling. Since we like the film so much, it is naturally difficult for us to choose just one gambling scene. However, our all-time favorite is the scene in which Robert De Niro tells his right-hand man, played by comedic legend, Don Rickles, to order a customer to take his feet off of a Blackjack table. Upon refusing, the latter is used as a battering ram. True, this is not a classic gambling scene, but a great scene nonetheless. All in all, we hope you liked our list of the eight greatest gambling scenes in the movies. Watch the movies we have included in the list and find out for yourself whether the best scenes really are the ones we have mentioned.